The 2016 Easton Mako Torq line of youth bats has some new features hitters will love, and it has also made significant improvements to the technology that players have come to know and rely on. From the new handles to the extended barrels, the Mako Torq line has everything a hitter could ever need to grab control of their game. It is time to start taking a look at the youth bats for the 2016 season, and there is no better company to start with than Easton. Over the years, the engineers at Easton have developed technology that has revolutionized the youth baseball world. Easton always makes sure that its bats are in compliance with the youth league guidelines, which means that everyone can benefit from the new developments that Easton has created for 2016. Easton was one of the first manufacturers to introduce the idea of a rotating grip. When the grip rotates with the swing, the hitter maintains the plane of the swing and has more control when the bat and ball make contact. Instead of turning the bat over in their hands, the hitter can keep the bat level and make good contact to deliver the results they want. With the 2016 Mako Torq line, Easton introduces the upgrade to the rotating grip called 360 TORQ technology. The handle on this new youth bat rotates 360 degrees, which offers a level of control the hitter has never had before. With this new technology, hitters can improve their swing plane and place the ball with more accuracy. The grip on the new Mako Torq is thinner than last year, and is enhanced by Easton’s Torq Taq technology. The whole configuration offers a level of comfort that has not been available before, and it is only available with the Mako Torq. Easton is known as one of the originators of the composite bat barrel, and the Mako Torq improves on that technology to deliver a youth bat that gets hitters great results. One of the keys to a good youth bat is making it as lightweight as possible. Easton has delivered on that need, and has done so with a bat that will change the youth baseball world. The barrel of the Mako Torq is made using Easton’s Thermal Composite Technology (TCT) system. It is a system that utilizes heat and composite materials to make a bat barrel with a longer sweet spot, but it remains lightweight enough to maintain perfect balance. With the advances made to the TCT system for 2016, Easton has made it easier for hitters to get great results at the plate. When Easton first introduced its Connexion Technology, hitters were not sure what to make of it. Easton uses more heat to fuse the grip and the barrel together in a precise manner. This process creates a lightweight and sturdy bat. But Connexion Technology also allows energy to be transferred away from the handle, and make each incident of contact more comfortable and productive. The point at where the grip meets the barrel is a critical part of any Easton bat, and the 2016 Mako Torq uses Connexion Technology to redistribute energy into the barrel and away from the grip. This prevents the vibrations that can occur during contact and focuses the energy back into the barrel. The end result is more comfortable contact that pushes the ball further into the outfield. The 2016 Easton Mako Torq is a youth bat that is a -10 differential and comes in a variety of sizes. The lengths range from 28 to 32 inches, with the weights ranging from 18 to 22 ounces respectively. No matter what size bat your youth hitter needs to feel comfortable at the plate, the Easton Mako Torq line has a bat that fits the bill. See more from the new 2016 Easton lineup right here! 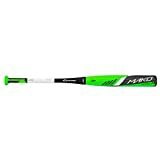 The 2016 Easton Mako Torq is certified by Little League, Babe Ruth Baseball and all of the other major youth baseball leagues around the country. This is a bat that is designed to be much more than a hitting tool. It is designed to help a young batter to correct their swing, and get the most from the contact they do make. If your youth hitter is having a problem making contact with the inside pitch, then this is the bat that will solve that problem. With its range of weights and sizes, the 2016 Mako Torq has a model that will fit into any young hitter’s game. When it comes to getting the most from every swing and offering a way to create a consistent plane for the bat to follow, nothing beats the 2016 Easton Mako Torq. This will be the bat all of the youth hitters will be using and talking about all year long.